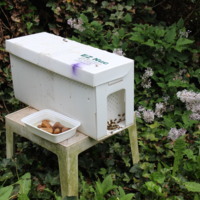 Nucleus Hive: This is a starter Nuc that is already populated with a queen and bees. The population is later transitioned or split into a bee box/s. Nicole Wines, “Apiculture Initiative: Nucleus Hive,” Raíces Cultural Center Digital Archive, accessed April 24, 2019, http://www.raicesculturalcenter.org/digital-archive/items/show/338.